This Butternut Squash and Pumpkin Soup is a tasty (and healthy) way to warm up on chilly Autumn evenings! We’ve grown pumpkins in our garden several times over the years. Last year, we got a couple tiny little pumpkins that I used as part of our Fall decorating. Truthfully, I’ve always wanted to grow a huge pumpkin though. Our friend’s father grows gigantic pumpkins in his yard, and the photos look awesome! But apparently they’re a bit harder to grow than just tossing some seeds into the ground. Oh well. Despite talking about gargantuan pumpkins, I actually cheated with this Butternut Squash and Pumpkin Soup. Instead of roasting pumpkin, I used a can of pureed pumpkin. I did roast the butternut squash, though, so I probably could’ve bought some of those little sugar pumpkins and roasted them at the same time…but we happened to have an extra can of pumpkin in the cabinet, so I used that instead. Either way, the flavor of this Butternut Squash and Pumpkin Soup is out of sight! Like I kinda wanted to lick my bowl when I was done. But I’m not a dog, so I refrained. Instead, I used a spatula to scrape up all the bits…and then I licked the spatula. Kidding! 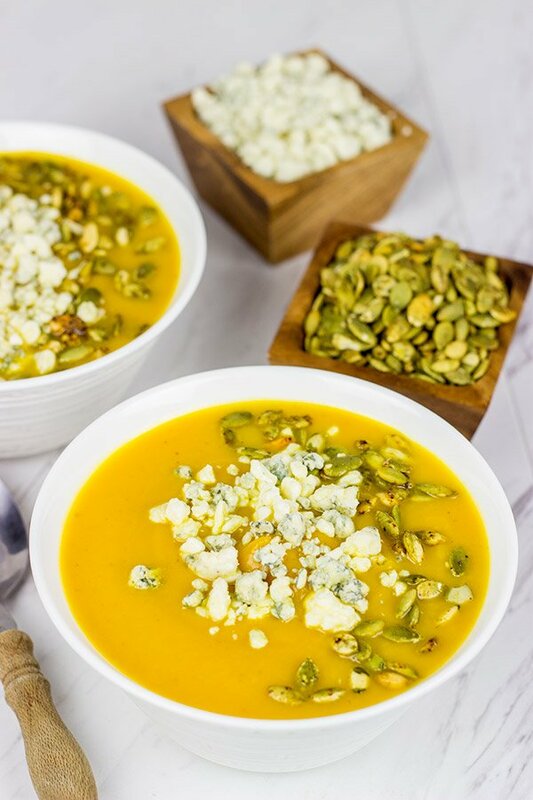 I’ve really gotten into adding fun toppings on soups lately, and I went with toasted pumpkin seeds and crumbled blue cheese for this Butternut Squash and Pumpkin Soup. The pumpkin seeds are kind of an obvious choice, and the extra bit of crunch adds a fun texture to each bite. (Tip: Add the toasted seeds right before serving this soup. If they sit in the soup too long, they’ll turn soft.) But the blue cheese is a bit different. I admit it. Laura went to reheat this soup for dinner, and I reached in and pulled the blue cheese from the fridge. She was thoroughly confused. I told her to trust me on this one. As she dipped her spoon in for the first bite, she once again reminded me that blue cheese is a strange addition. Then she took that bite. Then she admitted that the blue cheese totally works with butternut squash and pumpkin. Give it a shot and see what you think! This Butternut Squash and Pumpkin Soup was rather easy to make, too. My mother, sister and niece are planning a visit up here in a couple of weeks, and I’m thinking I’ll have a big pot of this soup simmering on the stove when they arrive. Enjoy this soup, my friends. And enjoy this Fall weather, too! Using a large bowl, add squash, onion and olive oil; toss until well combined. Spread squash and onion onto baking sheet. Roast at 400°F for 30 minutes, turning after 15 minutes. Remove tray from oven and transfer squash and onion into large stock pot or Dutch oven. Add pumpkin puree, vegetable broth, brown sugar, salt and nutmeg. Bring to a boil and then reduce heat to simmer; cover and simmer for 45-50 minutes. While the soup is simmering, make the spiced pumpkin seeds. Using a medium bowl, add pepitas, olive oil, brown sugar and Cajun seasoning; toss until well combined. Place pepitas in a small skillet; toast over medium heat, tossing often, for 4-5 minutes or until lightly browned and fragrant. Once soup has simmered, use an immersion blender to puree until smooth. Add half-and-half and stir until well combined. 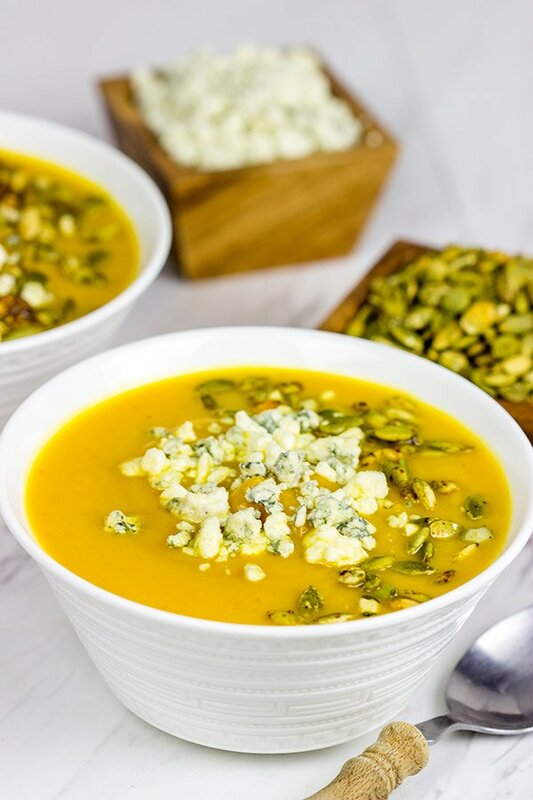 Top bowls of soup with toasted pepitas and crumbled blue cheese before serving. I always love making big batches of homemade soups, and pumpkin/squash is a great addition…especially this time of the year! Do give this one a shot, Dawn! 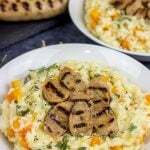 It’s super easy and super delicious, too! Thanks so much! Haha! Melons in October? What’s next? Ice cream in December? Just kidding! After all, we know ice cream in December is totally acceptable. 🙂 So feta or goat cheese would’ve been excellent toppings for this soup. But do give blue cheese a try. 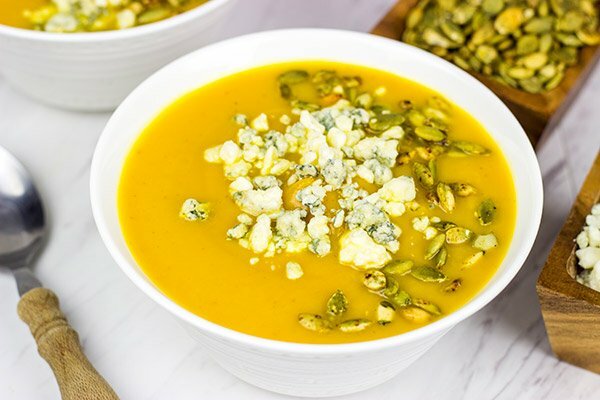 The tartness of the blue cheese totally works with the sweeter pumpkin flavor. And the salty pumpkin seeds are a must! Thanks, Ben! I’ve always wondered how people get their pumpkins to grow so big, and what the heck they do with them once they’re fully grown. Does a 2000-lb pumpkin even taste good? As for this soup, I’m thinking I need a huge bowl of it stat. Topped with plenty of blue cheese because I can totally see it working! Hi David! It is indeed soup season! 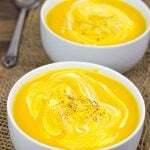 I really like squash soup and adding pumpkin gives it another dimension. 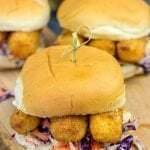 I think the addition of the blue cheese garnish is perfect! A nice chunk of crusty bread would be great for dunking! 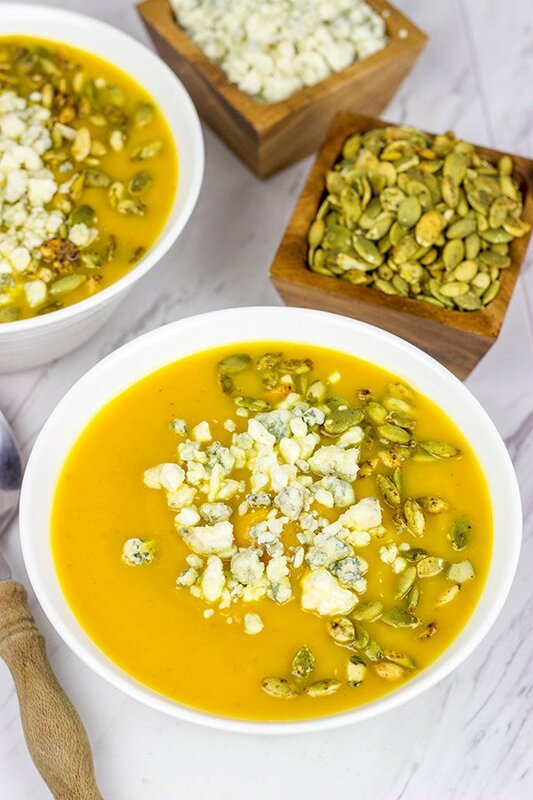 This soup is definitely perfect for these Fall days where the evenings are getting nice and crisp! Plus, this soup is surprisingly easy to make. The blue cheese + pumpkin seeds on top are a must, though. Yum! 🙂 Thanks, Mary! It most definitely IS soup season David! Yay! 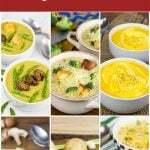 Can’t wait to launch all my new soup recipes next week! This is a tasty looking bowl of goodness. 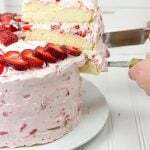 I can imagine that wonderful sweet flavour slipping down my throat. Yum! I only recently started adding some really great spices to squash when I’m roasting it, I might do this with a little cumin added into the roasting. Love the sound of those spiced pumpkin seeds too! Cumin with the roasted squash would be an excellent addition! And I cheated and used canned pumpkin, but I bet you could roast that up, too. This is one really, really tasty soup, too. We finished off the batch of this soup last week, and I kinda want to make another batch already! 🙂 Thanks, Neil…I can’t wait to see what soups you have up your sleeve! There is nothing nicer than a hot bowl of soup when it is cold & chilly outside – autumn is such a beautiful season! I once tried to grow pumpkins in the garden but as you said it takes more than just tossing seeds on the ground – unfortunately, it has not worked out for me so far. I like ‘odd’ combinations and can imagine that the blue cheese works nicely with the sweetness of the butternut squash and pumpkin plus it is now Laura approved so I am sure it works beautifully 🙂 Have a great weekend, David! Oh, I totally, 100% agree with you here, Miriam! I love the Fall, and I love coming inside to a simmering pot of soup sitting on the stovetop. So the blue cheese on top of this soup really is a must! I know it’s odd, but the tangy flavor of the cheese really pairs well with the sweetness of the pumpkin. Laura has always loved blue cheese and gingersnaps together, so this is kinda the same concept. Thanks so much, Miriam, and I hope you have a wonderful weekend as well! So definitely try pairing pumpkin/squash (ahem, this soup, ahem!) 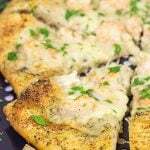 with blue cheese. The sweetness goes so well with the tangy cheese! Laura has also loved putting blue cheese on gingersnaps with a drizzle of honey…and this soup totally channels that concept. This soup definitely makes an excellent lunch! We just finished the batch recently, and I’m already craving another one! 🙂 Thanks, Dawn! I always put a sweet potato in with my butternut squash, but now you have me wanting to try pumpkin! This is my kind of comfort food when it gets chilly out and we had our first skiff of snow this morning, so perfect timing! Oooo…sweet potato! That would be another good option here. I wonder if we could do all 3? A sweet potato, pumpkin, butternut squash medley of sorts! 🙂 I was out in Denver this past week, and I saw my first snow of the year, too…I feel like it’s way too early! Either way, enjoy the season, and I hope you have an awesome weekend ahead, Marissa! This looks hearty and delicious. Pass me a loaf of crusty bread! Want to hear something kind of funny? I totally didn’t know that pepitas are the same thing as pumpkin seeds until now.. see that, you learn something new every day! Also funny that you brought up the latest North American pumpkin record… I used to do freelance journalism for a local newspaper when I lived in Northern Cali, and one year I covered a pumpkin contest, where this local guy broke the record (2014 I think it was). It was HUGE!! It wasn’t all that long ago that I learned pepitas = pumpkin seeds, too! But doesn’t it just sound fancier when you say pepitas? 🙂 I can’t imagine going out and actually seeing one of these ginormous pumpkins! But I seriously want to know what they do with those things once the contest is over. Crazy! Thanks, Nicole!! 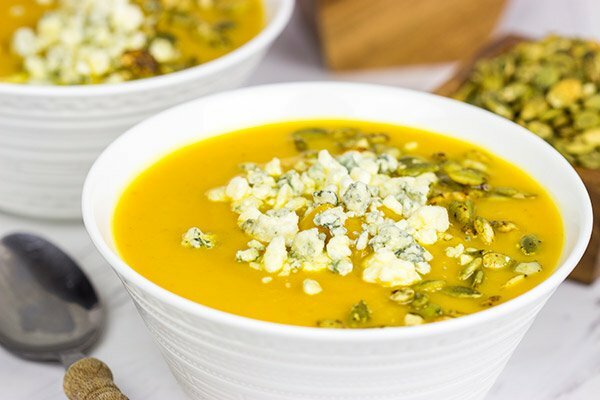 I never would have thought about adding blue cheese to a soup, but I think it works! Plus, I still have a huge amount of blue cheese that I must use up. Time to make some soup! 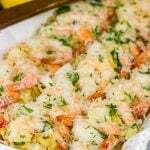 I want to make this for our Christmas Eve gathering but I can’t find how many servings your recipe makes. Could you provide me this helpful information. Thanks.